Crispy Fried Chicken at Hoop-Dee-Doo Musical Revue, Pioneer Hall, Disney’s Fort Wilderness Resort. On the menu since the dinner show opened in 1974, servers dish up about 900 pounds of fried chicken every night, and cooks spend about six hours each day just breading the chicken. Add 400 pounds of pork ribs, 120 pounds of corn, 400 pounds of mashed potatoes and 30 gallons of baked beans. Three shows nightly. Strawberry-Chicken Salad, Plaza Inn, Magic Kingdom. This simple salad has been tossed every day since the Magic Kingdom opened in 1971. Forget hot dogs and hamburgers, fans head to this little restaurant on Main Street, U.S.A., for a generous bowl of greens with grilled chicken breast, strawberries and Gorgonzola with white zinfandel vinaigrette. And you can end with a classic banana split or hot fudge sundae. Open daily for lunch and dinner. Cheddar Cheese Soup, Le Cellier Steakhouse, Canada pavilion, Epcot World Showcase. One of the most-requested recipes is for this creamy bowl of soup that’s made with Canadian beer, cheddar and Applewood-smoked bacon. It’s so popular that it’s also now a mainstay on the menu at the annual Epcot International Food & Wine Festival Canada Marketplace. Le Cellier Steakhouse is open daily for lunch and dinner. Creamy Lobster Soup, Coral Reef Restaurant, Epcot. With an amazing view of a coral reef with sharks, turtles, rays and fish (the largest inland saltwater environment ever built), the menu at this Future World restaurant changes often to reflect the seasons and sustainable seafood. But the Creamy Lobster Soup has never left the menu, an indulgent starter with fresh tarragon and a splash of Brandy. Open daily for lunch and dinner. Mom’s Old-Fashioned Pot Roast, 50’s Prime Time Cafe, Disney’s Hollywood Studios. Cobb Salad, The Hollywood Brown Derby, Disney’s Hollywood Studios. This salad was iconic before it was even on the menu at the Disney re-creation of the historic California restaurant. As the story goes, Brown Derby owner Bob Cobb tossed the first version for a late-night snack for a Tinsel Town movie star. The Disney version sticks to the original with finely chopped greens, turkey breast, eggs, blue cheese, bacon and avocado. Open daily for lunch and dinner. Potato-Wrapped Red Snapper, Flying Fish Cafe, Disney’s BoardWalk. While the chefs at Flying Fish Cafe cook with seasonality and sustainability in mind, this elegant dish has never left the menu since opening day in 1996. Fresh snapper is wrapped in thinly sliced potatoes, then pan-fried until crisp and golden. The fish is served over a rich leek fondue with veal glace de viande and red wine-cassis butter reduction. Open daily for dinner. Cedar Plank-roasted King Salmon, Artist Point, Disney’s Wilderness Lodge. You can smell the roasting cedar planks when you walk enter the spacious dining room that pays homage to America’s national park lodges. The menu incorporates tastes from coast to coast, but the most-ordered entrée is the Cedar Plank-roasted King Salmon served with seasonal vegetables, on the menu since opening day in 1994. Open daily for dinner. Tonga Toast, Kona Café, Disney’s Polynesian Resort. Kids of all ages keep coming back for their favorite “only on vacation” indulgent breakfast treat: deep-fried banana-stuffed sourdough French toast rolled in cinnamon sugar and served with strawberry compote. The Tonga Toast has been a favorite since the Polynesian opened in 1971. Open daily for breakfast. For all of you Tonga Toast fans out there, here’s a video about this favorite as well as the recipe in case you are having a craving. Mix sugar and cinnamon in medium bowl (large enough to roll toast) with a fork until thoroughly blended. Set aside. Whip eggs in medium bowl (large enough to dip toast) until well beaten. Add milk, cinnamon, and sugar. Slice the bread into four three-inch-thick slices. Cut each banana in half crosswise, then each piece lengthwise. Place a bread slice flat on the counter and tear out just enough from the middle (do not tear all the way through) to stuff half a banana into; repeat with each bread slice. Dip stuffed bread into batter, covering both sides, allowing excess batter to drip off bread and place carefully into hot oil. Cook 4-5 minutes until golden brown. If needed, turn toast over after 2 minutes and cook for another 2 minutes on other side. Remove and drain excess oil. Roll toast in cinnamon-sugar. Repeat for each piece of toast. Check out my book A Tale Of Two Resorts: Disneyland and Walt Disney World – A Traveler’s Reference filled with information to help you plan your vacation! Plan ahead with the most updated list of Disney World Scheduled Refurbishments! Have you tried any of these dishes before? Do you have a favorite? Congratulations! That is so exciting! For the absolute best fine dining experience in Walt Disney World, check out Victoria & Albert’s. (https://disneyworld.disney.go.com/dining/grand-floridian-resort-and-spa/victoria-and-alberts/) It has received the AAA Five Diamond Award since 2000. It is quite expensive, so if you are looking for something with a more reasonable price tag, but still elegant with an incredible view, you also might want to look at the California Grill at the Contemporary. 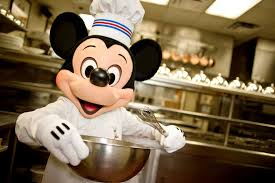 (https://disneyworld.disney.go.com/dining/contemporary-resort/california-grill/) Both of these locations book up quickly as well as most restaurants in Disney World anymore, so be sure to book your dining reservation 180 days in advance if possible. Don’t forget to note on your reservation that your are celebrating your 50th anniversary and pick up some free celebration buttons to wear during your stay. Disney will often surprise you with some extra magic throughout your stay when you are celebrating something as special as your 50th wedding anniversary. Please let me know if I can help you with anything else and I hope you have a magical celebration!